Lowongan Kerja KPJB – PT Komipo Pembangkitan Jawa Bali – KPJB is a rapidly growing company in Indonesia that deals with power plant operation and maintenance (O&M). KPJB was formed in 2010 and based in Jepara Central Java to operate and maintain Tanjung Jati B Coal Fired Power Plant Unit 3 & 4 (2×660 MW). The Company is owned Korea Mindland Power Co Ltd (Komipo) Korea and PT Pembangkitan Jawa Bali (PJB), respectively with share ownership of 51% and 49%. PJB is a strategic subsidiary company of PT PLN (Persero), a national electricity company of Indonesia. Based on PT Pembangkitan Jawa Bali Annual Report 2011, PT Komipo Pembangkitan Jawa Bali manages Rp166.8 billion as its total assets in 2011. The Company’s profit earned in 2011 was Rp36.4 billion. or by email to [email protected] with additional remarks : position name of application on left above corner for mail/letter application, and or write it on subject space of e-mail application. 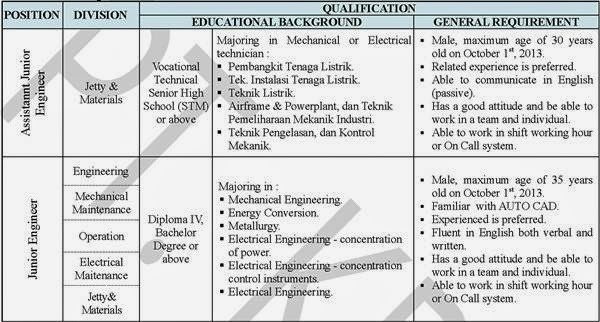 Qualified applicants shall submit the application letter in English no later than 4 October 2013 at 13.00 (accepted by HR Division of PT KPJB). Jobelist.com - Powered by wordpress - 18 queries. 2.072 seconds.